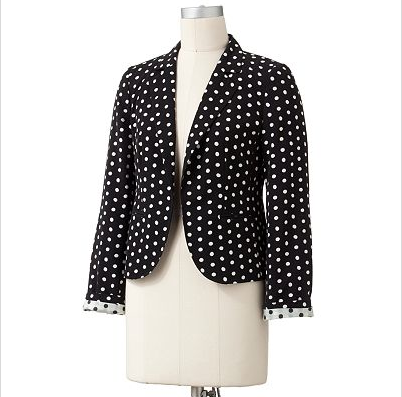 As I mentioned in my post HERE, polka dots are all the rage this fall. Not just polka dotted nails as I posted about last week, but polka dotted CLOTHING and ACCESSORIES are EVERYWHERE this fall....and I'm happy to say I'm TOTALLY on the polka dot train!!! I bought a polka dotted blazer at my go-to store F21 last spring but have been saving it for when the weather turned cooler. 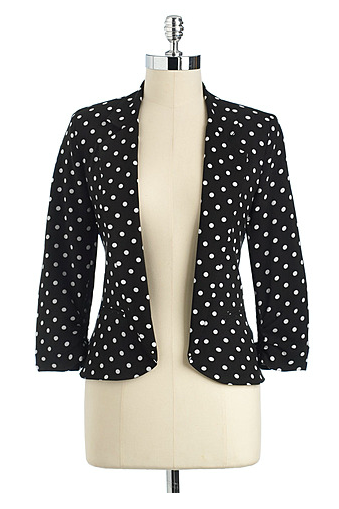 First of all I would like to mention that I absolutely LOVE blazers. I have worn them on my blog in the past, and I'm so so so excited that they are in once again this fall. A blazer is another one of my outfit game changers (along with belts...belts are another one of my fave outfit makers). Anyway, a blazer can totally pull a look together and it's the PERFECT way to transition your summer wardrobe into the fall. Add a blazer to a sundress plus booties = insta-fall outfit. As I was saying, I was so excited to finally get to wear my polka dotted blazer this weekend and decided to go with the classic black/white/red color combo. Who doesn't love a pop of RED with black and white?? So classy but fun!! Finally it was time to break out my red pants for this season! Who else has boarded the polka dot train with me?! I hope y'all have a great rest of your week and if you haven't already don't forget to enter my blog giveaway by clicking HERE for a chance to win up to $45 in giftcards! Thanks so much dolls, as always!